Spaghetti is another meal we have in our house at least once a month. I was craving it and decided to make a meatless version. In the past, it was noodles, sauce, an onion, and hamburger meat. Not anymore! I love it so much it’s also usually a dinner at Mom’s house when I go home. 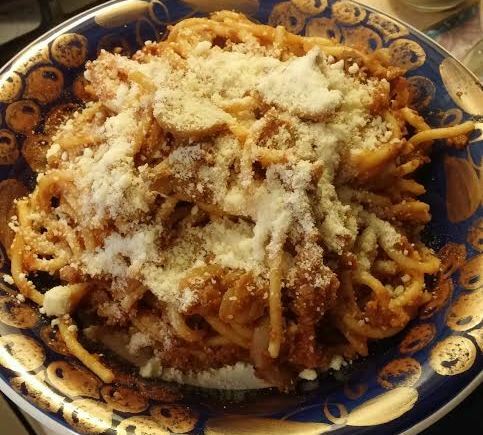 She has a red sauce and a white sauce spaghetti recipe and usually makes a pot of both when I visit. It’s served with homemade slaw, green beans, corn, and bread sticks. Nothing beats Mom’s spaghetti and I’ve never been able to replicate it. And, meatless or not, I probably won’t stop eating it when I go home. It’s one of those fond memories of home. I will say this meatless version was awesome though. And again, if I didn’t tell you what was in it, you’d probably never guess it wasn’t meat. Boil the noodles until tender and then drain. Keep about a cup of the starchy water! While the noodles are boiling, saute the onions with a bit of butter or coconut oil. Add the cup of water you saved back to the noodles and stir. Remember, the water keeps the noodles from getting too dry and also makes them nice and glossy looking. Add the onions and mushrooms to the noodles and toss while cooking on medium heat. Immediately stir in the entire jar of sauce or how much ever you prefer. Add the smart ground crumbles (this is the same ingredient I had in my meatless chili recipe). I use the entire box. Then season with salt, pepper, and Italian seasonings. You could even add minced garlic or diced peppers if you want. Stir until hot and then serve with Parmesan cheese. You could easily get about 8 small portions out of this if you use the entire box of noodles, but for two of us, it’s about 6 servings. If you use the entire box of noodles to make a large pot, then 6 servings are about 630 calories each. That’s kind of high, but for us this is a one pot meal that we don’t really eat with anything else so we don’t mind the high calorie count. Plus, it’s got 30 grams of protein per serving, 11 grams of fiber, and only 3 grams of fat. Again, you can control the calorie count by what type of sauce you use and how much, what type of noodles you use and how much, and what else you choose to eat with your spaghetti. How you like your spaghetti?